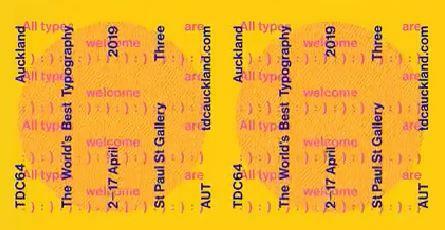 Direct from its New York showing, TDC64 Auckland is the latest exhibition from the world-renowned Type Directors Club competition, showcasing a culturally diverse and exciting range of award-winning work from over 35 countries. Chosen from 1,835 entries by some of the design industry’s most recognised mentors, innovators and thought-leaders, with work in dozens of languages, TDC64 will be displayed in seven exhibitions that visit over 50 countries. Founded in 1946 by the industry’s leading design practitioners, the Type Directors Club is an international organisation whose purpose is to support, record and celebrate excellence in typography, both in print and on screen.